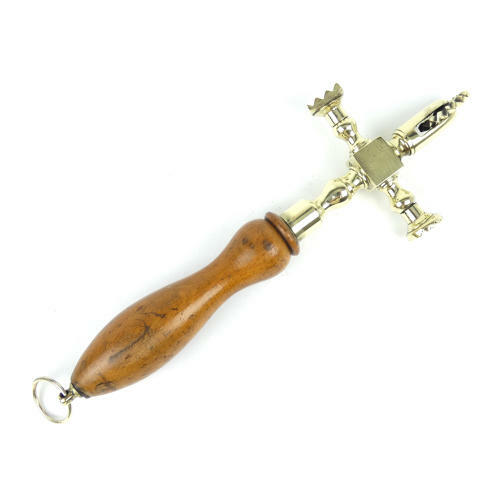 A brass, cruciform pastry tool with a turned wooden handle. This piece is well made and it dates from c.1870. The tool section is cast in brass. It has a wheel for cutting the rim of a pie and, to either side, are shaped markers fro impressing a design in the pastry, one circular and one square. The turned wooden handle has been varnished and there is a fine brass ring in the end so that the tool can hang. There is slight marking to the wood but other than that the piece is in excellent condition.